This Member Agreement (this “Agreement”) contains the terms and conditions that govern your access to and use of the Service (as defined below) and is an agreement between StocksToTrade.Com, Inc. (“we,” “us,” “our,” “StocksToTrade,” “Investimonials.Com,” “SteadyTrade.Com,” or the “Company”) and you or the entity you represent (“you“). This Agreement takes effect when you sign a Subscription Order or, if earlier, when you use the Service (the “Effective Date“). You represent to us that you are lawfully able to enter into contracts (e.g., you are age of 18 or older). If you are entering into this Agreement for an entity, such as the company you work for, you represent to us that you have legal authority to bind that entity including, without limitation the ARBITRATION AND CLASS ACTION provisions found in Section 12.8 Please see Section 13 for definitions of certain capitalized terms used in this Agreement. You consent to our collection, use and disclosure of information associated with the Service in accordance with our Privacy Statement. 4.1 Service Trial. StocksToTrade, may offer an evaluation period, or trial, for its services for first time subscribers. Customers are only allowed to evaluate the product only one (1) time over their lifetime. Customers having previously subscribed to any of StocksToTrade offerings will not benefit from the trial and will automatically be billed the subscription fee upon registration or renewal regardless of the mention “Trial” under the product description. 4.2 Payment. StocksToTrade, will charge the subscription fee and any other additional fees or charges you authorize on the credit card provided by you and starting on the date stated by your subscription invoice or other previous payment agreement established between us and you. 4.3 Credit Card Authorization. By authorizing StocksToTrade, to charge a credit card for the fees associated with your Service, you are authorizing StocksToTrade to automatically continue charging that card (or any replacement card if the original card is renewed, lost, stolen, or changed for any reason by the card issuer, and the issuer informs StocksToTrade of the new replacement card account) for all fees or charges associated with your subscription to the Service including any renewal fees as described below. Credit cards that are declined for any reason are subject to a thirty-dollar ($30.00) declination fee. StocksToTrade, may elect to interrupt Service for fees that reach ten (10) days past due. Service interrupted for nonpayment is subject to a twenty percent (20%) out of outstanding amount as a reconnection charge. Accounts not paid by due date are subject to a ten dollar ($10) late fee. Accounts that are not collectable by StocksToTrade,Inc. may be turned over to an outside agency for collection. If your account is turned over for collection, you agree to pay StocksToTrade a processing and collection fee the lesser of one hundred and fifty dollars ($150.00) or as allowed by applicable law. 4.4 Automatic Renewal of Subscription. When you subscribe to the Service your subscription will be set to automatically renew upon its expiration. This means that unless you explicitly cancel the Service prior to its expiration date, your Service will automatically renew for the same term. At the time of renewal, we will charge your credit card, or invoice you, the then-current fees to renew the Service. 4.5 Cancellations and Refunds. All fees and charges paid by you in relation to the Service are non-refundable, except (i) you may cancel this Agreement at any time prior to midnight of the third business day as provided for in your Subscription Order following the renewal date or (ii) if we terminate this Agreement for convenience. Following cancellation, StocksToTrade, reserves the right to (i) limit or restrict access to the Service and (ii) delete all Your Content. 4.6 Changes in Price. StocksToTrade, may, at any time, change the price of the Service or any part thereof, or institute new charges or fees. Price changes and institution of new charges implemented during an existing subscription term for the Service will apply to subsequent subscription terms and to all new members after the effective date of the change. If you do not agree to any such price changes, then you must cancel your account and stop using the Service. Your continued use of the Service after the effective date of any such change shall constitute your acceptance of such change. 4.7 Taxes. Charges for Services hereunder do not include any federal, state, local or foreign taxes, duties or levies of any nature (“Taxes”). Any Taxes required to be paid by StocksToTrade as a result of the Service rendered hereunder (other than Taxes based on StocksToTrade’s income) shall be billed to and paid by you. 4.8 Fee Disputes. You agree that if there are problems or questions regarding the Service that you will contact StocksToTrade for assistance and not dispute any charges from us unless you terminate for breach as provided in this Agreement. You agree to inform StocksToTrade of any credit card information changes, including expiration date. You represent and warrant that you are legally authorized to enter into Agreement including use of the credit associated with the account. You agree to provide StocksToTrade with at least three (3) days prior written notice to request termination of any recurring credit card authorization and transition to another form of billing. (a) Termination for Convenience. You may terminate this Agreement for any reason by (i) providing us written notice and (ii) closing your account for which we provide you Service and for which we provide an account closing mechanism. We may terminate this Agreement for any reason by providing you 30 days advance notice. (ii) By Us. We may also terminate this Agreement immediately upon notice to you (A) for cause, if any act or omission by you results in a suspension described in Section 6.1, (B) if our relationship with a third party partner who provides material elements we use to provide the Service expires, terminates or requires us to change the way we provide these elements as part of the Service, (C) if we believe providing the Service could create a substantial economic or technical burden or material security risk for us, (D) in order to comply with the law or requests of governmental entities, or (E) if we determine use of the Service by you or our provision of any of the Services to you has become impractical or unfeasible for any legal or regulatory reason. (d) Sections 4.1, 4.2, 4.6, 6.3, 7 (except the license granted to you in Section 7.4), 8, 9, 10, 11, 12, and 13 will continue to apply in accordance with their terms. 7.1 Your Content. You or your licensors own all right, title, and interest in and to Your Content. Except as provided in this Section 7, we obtain no rights under this Agreement from you or your licensors to Your Content, including any related intellectual property rights. You consent to our use of Your Content to provide the Service to you. We may disclose Your Content to provide the Service to you or to comply with any request of a governmental or regulatory body (including subpoenas or court orders). 7.2 Adequate Rights. You represent and warrant to us that: (a) you or your licensors own all right, title, and interest in and to Your Content and Your Submissions; (b) you have all rights in Your Content and Your Submissions necessary to grant the rights contemplated by this Agreement; and (c) none of Your Content, Your Submissions of Your Content, Your Submissions or the Service will violate the Acceptable Use Policy. 7.3 Service License. As between you and us, we or our affiliates or licensors own and reserve all right, title, and interest in and to the Service. We grant you a limited, revocable, non-exclusive, non-sublicensable, non-transferable license to do the following during the Term: (i) access and use the Services solely in accordance with this Agreement; and (ii) use the StocksToTrade content solely in connection with your permitted use of the Services. Except as provided in this Section 7.3, you obtain no rights under this Agreement from us or our licensors to the Service, including any related intellectual property rights. 7.4 License Restrictions. You may not use the Service in any manner or for any purpose other than as expressly permitted by this Agreement. You may not, or may not attempt to: (a) modify, alter, tamper with, or otherwise create derivative works of any intellectual property included in the Service, (b) reverse engineer, disassemble, or decompile the Service, (c) access or use the Service in a way intended to avoid incurring fees,(d) resell or sublicense the Service, (e) copy the look-and-feel or functionality of the StockToTrade’s Marks or Site; (f) remove any StocksToTrade’s Marks without our prior written consent; (g) use, redistribute, encumber, sell, rent, lease, sublicense, or otherwise transfer rights to, and/or exploit, the Services for commercial purposes, or in a commercial manner; or (g) use our Service in any way that is not in compliance with all applicable laws, regulations and government authorizations, including but not limited to securities laws, export control, copyright, trademarks, secrecy, defamation, decency, and privacy related laws, regulations and authorizations. All licenses granted to you in this Agreement are conditional on your continued compliance this Agreement, and will immediately and automatically terminate if you do not comply with any term or condition of this Agreement. During and after the Term, you will not assert, nor will you authorize, assist, or encourage any third party to assert, against us or any of our affiliates, customers, vendors, business partners, or licensors, any patent infringement or other intellectual property infringement claim regarding any Service you have used. 8.1 General. You will defend, indemnify, and hold harmless us, our affiliates and licensors, and each of their respective employees, officers, directors, and representatives from and against any claims, damages, losses, liabilities, costs, and expenses (including reasonable attorneys’ fees) arising out of, relating to, or concerning: (a) your use of the Service; (b) breach of this Agreement or violation of applicable law by you; (c) Your Content or the combination of Your Content with other applications, content or processes, including any claim involving alleged infringement or misappropriation of third-party rights by Your Content or by the use, development, design, production, advertising or marketing of Your Content; or (d) a dispute between you and a third party. If we or our affiliates are obligated to respond to a third party subpoena or other compulsory legal order or process described above, you will also reimburse us for reasonable attorneys’ fees, as well as our employees’ and contractors’ time and materials spent responding to the third party subpoena or other compulsory legal order or process at our then-current hourly rates. 8.2 Process. We will promptly notify you of any claim subject to Section 8.1, but our failure to promptly notify you will only affect your obligations under Section 9.1 to the extent that our failure prejudices your ability to defend the claim. You may: (a) use counsel of your own choosing (subject to our written consent) to defend against any claim; and (b) settle the claim as you deem appropriate, provided that you obtain our prior written consent before entering into any settlement. We may also assume control of the defense and settlement of the claim at any time. 9.2 Financial and Other. NEITHER StocksToTrade, INDIVIDUALLY, NOR ITS WEBSITES INCLUDING, BUT NOT LIMITED TO THE StocksToTrade, SITE, NOR ANY OF ITS OFFICERS, EMPLOYEES, REPRESENTATIVES, AGENTS, INDEPENDENT CONTRACTORS, OR SUBCONTRACTORS ARE, IN SUCH CAPACITIES, LICENSED FINANCIAL ADVISORS, REGISTERED INVESTMENT ADVISORS, OR REGISTERED BROKER-DEALERS UNLESS OTHERWISE EXPRESSLY PROVIDED. StocksToTrade, MAKES NO REPRESENTATIONS OR WARRANTIES ABOUT THE ACCURACY OR COMPLETENESS OF THE INFORMATION PROVIDED IN CONNECTION WITH THE SERVICE. NO INFORMATION PROVIDED BY StocksToTrade,, INCLUDING BUT NOT LIMITED TO TIMOTHY SYKES, IS INTENDED AS SECURITIES BROKERAGE, INVESTMENT, TAX, ACCOUNTING OR LEGAL ADVICE, AS AN OFFER OR SOLICITATION OF AN OFFER TO SELL OR BUY, OR AS AN ENDORSEMENT, RECOMMENDATION OR SPONSORSHIP OF ANY COMPANY, SECURITY OR FUND OR AS ADVICE TAILORED TO YOUR OR ANY MEMBER’S PARTICULAR SITUATION. ANY URL LINKS OR COMPANY NAMES OR TICKER SYMBOLS ARE OFFERED AS A MATTER OF CONVENIENCE AND NOTHING CONTAINED IN THIS AGREEMENT OR IN THE SERVICE CONSTITUTES A SOLICITATION, RECOMMENDATION, PROMOTION, ENDORSEMENT, OR OFFER BY StocksToTrade, OF ANY PARTICULAR SECURITY, TRANSACTION, OR INVESTMENT. StocksToTrade,, INCLUDING BUT NOT LIMITED TO TIMOTHY SYKES AND AFFILIATES, MAY HAVE POSITIONS IN THE SECURITIES MENTIONED AND MAY ENTER AND EXIT SUCH POSITIONS AT ANY TIME AND FOR ANY REASON. THE RISK OF LOSS IN TRADING SECURITIES, OPTIONS, FUTURES, FOREX, AND COMMODITIES CAN BE SUBSTANTIAL AND ARE NOT SUITABLE FOR ALL INVESTORS. YOU MUST CONSIDER ALL RELEVANT RISK FACTORS, INCLUDING YOUR OWN PERSONAL FINANCIAL SITUATION, BEFORE TRADING. YOU ASSUME THE RISK OF ANY AND ALL FINANCIAL INVESTMENTS YOU MAKE. StocksToTrade, IS NOT RESPONSIBLE FOR ANY FINANCIAL INVESTMENTS YOU MAKE. 11.1 Confidentiality. You may use StocksToTrade’s., Confidential Information only in connection with your use of the Service as permitted under this Agreement. You will not disclose StocksToTrade’s Confidential Information during the term or at any time during the five (5) year period following the end of the term. You will take all reasonable measures to avoid disclosure, dissemination or unauthorized use of StocksToTrade’s Confidential Information, including, at a minimum, those measures you take to protect your own confidential information of a similar nature. The foregoing restrictions shall not apply to the extent you must defend yourself in an action related to this Agreement, or to respond to an investigation by a governmental agency initiated by that agency or to report any truthful incidents of illegal conduct directed at you to law enforcement. 11.2 Non-Disparagement. The parties agree that during the term of this Agreement and for a period of twenty-four (24) months immediately following expiration or termination for any reason, whether with or without cause, each shall not, not to (i) make any statements, written or verbal, or cause or encourage others to make any statements, written or verbal, that defame, disparage or in any way criticize the personal or business reputation, practices, or conduct of the other or, as to StocksToTrade, its respective employees, officers, directors, managers, members and affiliates or with respect to you (ii) publish or attempt to publish any narrative, fictional or otherwise, concerning or based, in whole or in part, on StocksToTrade, without StocksToTrade’s prior written consent or without leave of court. Each party acknowledges and agrees that this prohibition extends to statements, written or verbal, made to anyone, including but not limited to, the news media, investors, potential investors, any board of directors or advisory board or directors, industry analysts, competitors, strategic partners, vendors, employees (past and present), StocksToTrade’s Site users, clients or potential clients. (c) interfere with StocksToTrade’s (including its officers, managers, employees, and affiliates) personal or business relationships concerning the Service or this Agreement. The Parties understand and agree that this Section 11 is a material provision of this Agreement and that any breach of this Section shall be a material breach of this Agreement, and that StocksToTrade would be irreparably harmed by any violation and that it would have no adequate remedy at law for such a violation. As such, you therefore consent to immediate injunctive relief by a court of competent jurisdiction as a remedy for any violation of these terms of the Agreement. You further acknowledge that any actions taken not in compliance with this Section are considered as purposefully directed at StocksToTrade and that any actions for alleged injuries arise out or relate to activities in connection violations of this Section. 12.2 Independent Contractors; Non-Exclusive Rights. We and you are independent contractors, and neither party, nor any of their respective affiliates, is an agent of the other for any purpose or has the authority to bind the other. Both parties reserve the right (a) to develop or have developed for it products, services, concepts, systems, or techniques that are similar to or compete with the products, services, concepts, systems, or techniques developed or contemplated by the other party and (b) to assist third party developers or systems integrators who may offer products or services which compete with the other party’s products or services. (a) To You. We may provide any notice to you under this Agreement by: (i) posting a notice on the StocksToTrade’s Site; or (ii) sending a message to the email address then associated with your account. Notices we provide by posting on the StocksToTrade’s Site will be effective upon posting and notices we provide by email will be effective when we send the email. It is your responsibility to keep your email address current. You will be deemed to have received any email sent to the email address then associated with your account when we send the email, whether or not you actually receive the email. (b) To Us. To give us notice under this Agreement, you must contact StocksToTrade as follows: (i) by personal delivery, overnight courier or registered or certified mail to StocksToTrade.Com, Inc. 135 S. State College Blvd. Suite 200, Brea, CA 92821, United States. We may update the facsimile number or address for notices to us by posting a notice on the StocksToTrade’s Site. Notices provided by personal delivery will be effective immediately. Notices provided by facsimile transmission or overnight courier will be effective one business day after they are sent. Notices provided registered or certified mail will be effective three business days after they are sent. 12.5 Assignment. You will not assign this Agreement, or delegate or sublicense any of your rights under this Agreement, without our prior written consent. Any assignment or transfer in violation of this Section 12.5 will be void. Subject to the foregoing, this Agreement will be binding upon, and inure to the benefit of the parties and their respective successors and assigns. 12.7 Severability. If any portion of this Agreement is held to be invalid or unenforceable, the remaining portions of this Agreement will remain in full force and effect. Any invalid or unenforceable portions will be interpreted to effect and intent of the original portion. If such construction is not possible, the invalid or unenforceable portion will be severed from this Agreement but the rest of the Agreement will remain in full force and effect. 12.8 Governing Law; Procedures for Dispute Resolution; 30-day Arbitration and Opt-Out Policy. ALL DISPUTES WITH STOCKSTOTRADE.COM, INC. ARISING IN ANY WAY FROM THIS AGREEMENT OR THE USE OF THE SERVICES SHALL BE RESOLVED EXCLUSIVELY THROUGH FINAL AND BINDING ARBITRATION, AND NOT BY A COURT OR JURY. ANY SUCH DISPUTE SHALL NOT BE COMBINED OR CONSOLIDATED WITH A DISPUTE INVOLVING ANY OTHER PERSON’S OR ENTITY’S PRODUCT OR CLAIM, AND SPECIFICALLY, WITHOUT LIMITATION OF THE FOREGOING, SHALL NOT UNDER ANY CIRCUMSTANCES PROCEED AS PART OF A CLASS ACTION. THE ARBITRATION SHALL BE CONDUCTED BEFORE A SINGLE ARBITRATOR, WHOSE AWARD MAY NOT EXCEED, IN FORM OR AMOUNT, THE RELIEF ALLOWED BY THE APPLICABLE LAW. The arbitration shall be conducted according to the American Arbitration Association (AAA) Commercial Arbitration Rules applicable to consumer disputes. The AAA Rules are available online at adr.org or by calling the AAA at 1-800-778-7879. This arbitration provision is entered pursuant to the Federal Arbitration Act. The laws of the State of California, without reference to its choice of laws principles, shall govern the interpretation of the Agreement and all disputes that are subject to this arbitration provision. The arbitrator shall decide all issues of interpretation and application of this arbitration provision. For any arbitration in which your total damage claims, exclusive of attorney fees and expert witness fees, are $5,000.00 or less (“Small Claim”), the arbitrator may, if you prevail, award your reasonable attorney fees, expert witness fees and costs as part of any award, but may not grant STOCKSTOTRADE.COM, Inc. its attorney fees, expert witness fees or costs unless it is determined that the claim was brought in bad faith. In a Small Claim case, you shall be required to pay no more than half of the total administrative, facility and arbitrator fees, or $5,000.00 of such fees, whichever is less, and STOCKSTOTRADE.COM, Inc. shall pay the remainder of such fees. Administrative, facility and arbitrator fees for arbitrations in which your total damage claims, exclusive of attorney fees and expert witness fees, exceed $5,000.00 (“Large Claim”) shall be determined according to AAA rules. In a Large Claim case, the arbitrator may grant to the prevailing party, or apportion among the parties, reasonable attorney fees, expert witness fees and costs. Judgment may be entered on the arbitrator’s award in any court of competent jurisdiction. This arbitration provision also applies to claims against STOCKSTOTRADE.COM, Inc’s employees, representatives and affiliates if any such claim arises from the Product’s sale, condition or performance. 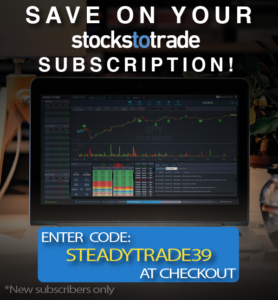 You may opt out of this dispute resolution procedure by providing notice to STOCKSTOTRADE.COM, Inc. no later than 30 calendar days from the date of your registration of your StocksToTrade Pro Membership. To opt out, you must send notice by e-mail to legal@stockstotrade.com, with the subject line: “Arbitration Opt Out.” You must include in the opt out email (a) your name, address and, to the extent applicable, the email address used in connection with your StocksToTrade Pro Membership and (b) the date on which you first registered your StocksToTrade Pro Membership. “StocksToTrade’s Confidential Information” means all nonpublic information disclosed by us, our affiliates, business partners or our or their respective employees, contractors or agents that is designated as confidential or that, given the nature of the information or circumstances surrounding its disclosure, reasonably should be understood to be confidential. StocksToTrade’s Confidential Information includes: (a) nonpublic information relating to our or our affiliates or business partners’ technology, customers, business plans, promotional and marketing activities, finances and other business affairs including, but not limited to our proprietary methodology providing information and education to you so that you may conduct your own investment research and consider your own investment decisions ; (b) third-party information that we are obligated to keep confidential; and (c) the nature, content and existence of any discussions or negotiations between you and us or our affiliates. StocksToTrade’s Confidential Information does not include any information that: (i) is or becomes publicly available without breach of this Agreement; (ii) can be shown by documentation to have been known to you at the time of your receipt from us; (iii) is received from a third party who did not acquire or disclose the same by a wrongful or tortious act; (iv) can be shown by documentation to have been independently developed by you without reference to the StocksToTrade’s Confidential Information; or (v) discloses your own trading activities but does not mention StocksToTrade’s proprietary methodology and other aspects of the Service. “StocksToTrade Content” means Content we or any of its affiliates make available in connection with the Service or on the StocksToTrade’s Software and/or Site to allow access to and use of the Service; Documentation; software libraries; command line tools; and other related technology. StocksToTrade’s Content does not include the Service. “StocksToTrade’s Marks” means any trademarks, service marks, service or trade names, logos, and other designations of StocksToTrade’s and its affiliates that we may make available to you in connection with the Service or this Agreement. “StocksToTrade’s Site(s)” means https://www.stockstotrade.com, investimonials.com, steadytrade.com and any successor or related site designated by us. “Policies” means the Acceptable Use Policy, the Site Terms, and all restrictions described in the StocksToTrade’s Content and on the StocksToTrade’s Site, and any other policy or terms referenced in or incorporated into this Agreement. “Privacy Statement” means the privacy statement currently referenced at https://stockstotrade.com/privacy-policy/ , as we may update from time to time. “Service” means each of the services made available by us or our affiliates, including any web services described in the Site Terms, the StocksToTrade Content, the StocksToTrade Marks, the StocksToTrade Site, and any other product or service provided by us under this Agreement. Service does not include Third Party Content. “Third Party Content” means Content made available to you by any third party on the StocksToTrade Site or in conjunction with the Service. “Your Content” means Content you (a) disclose, share, or upload on or to the Service, (b) cause to interface with the Services, or (c) upload to the Service under your account or otherwise transfer, process, use or store in connection with your account. “Your Submissions” means Content that you post or otherwise submit to developer forums, sample code repositories, public data repositories, or similar community-focused areas of the StocksToTrade Site or the Service.